Remember the Telephone Game from when we were kids? The one where a bunch of people sit in a circle, and one person starts by whispering a message into the ear of their neighbor, and that person turns and whispers (what is supposed to be) the same message into their neighbor’s ear, and so on and so forth until the message comes back around to the first person? And, inevitably, the message has become something completely different from what it started out as? Well, this is that game, only in food blog form. 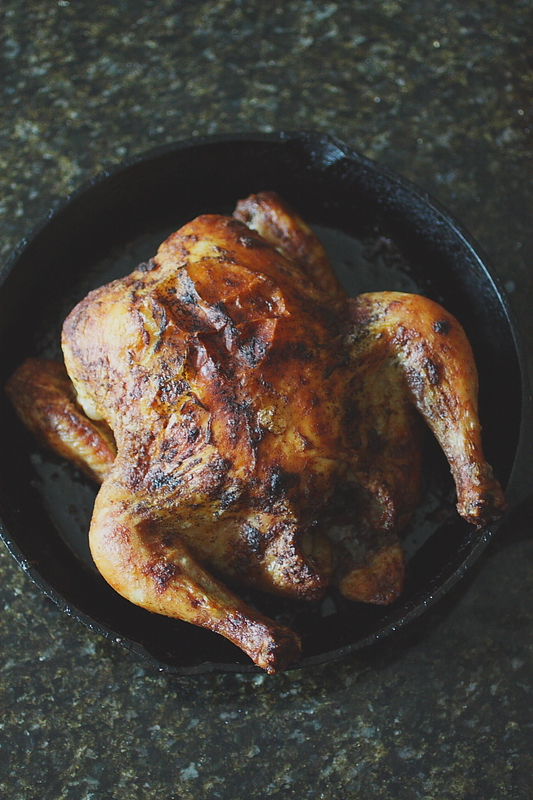 Like a bunch of us are standing in a globe-spanning circle connected by the interwebs, and we’re passing a roast chicken recipe from blog to blog, waiting to see how it changes and evolves as each person puts their own spin on it. Which is, if you really think about it, what makes food writing/blogging so interesting and, dare I say it, controversial. There are countless arguments back and forth over what constitutes an “original” recipe, what constitutes plagiarism in recipes, and what can and cannot be copyrighted when it comes to recipes. Diane Jacob, in a March 17, 2010 post on her Will Write for Food blog, writes that “it’s not … legal to copy a recipe verbatim and give credit, unless you have permission from the publisher, let alone change a few things but not enough and not give credit.” And yet, time and again, you see people copying recipes out of cookbooks and publishing them on their blogs (with or without credit), blind to the fact that they are breaking any rules, let alone being deviant enough to actually break a law. Intellectual property is a complicated and mysterious thing. I’ve even done it myself, before I knew what the rules actually were. Even more complicated is what constitutes “adapting” a recipe. 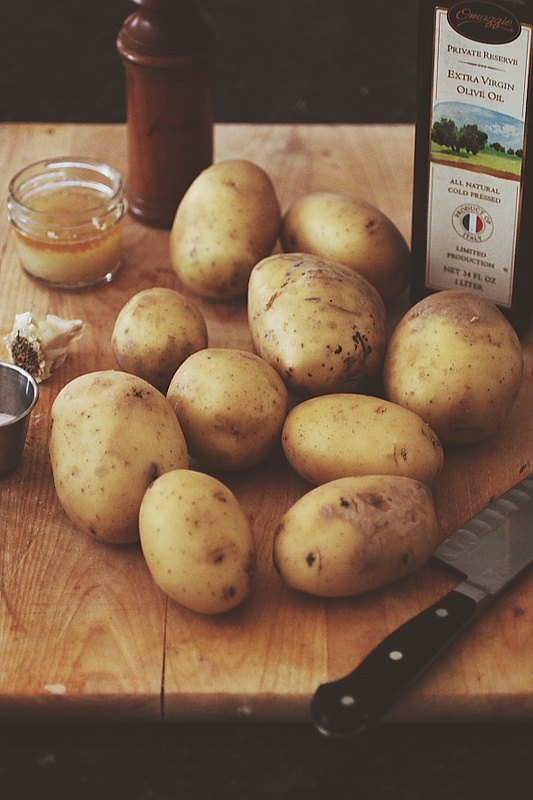 The generally accepted standard is that if you change three things in a recipe, then you can call it yours. This has proven to be a gray area for some folks, though. I think it’s always a good idea to credit the original source, just to be on the safe side. 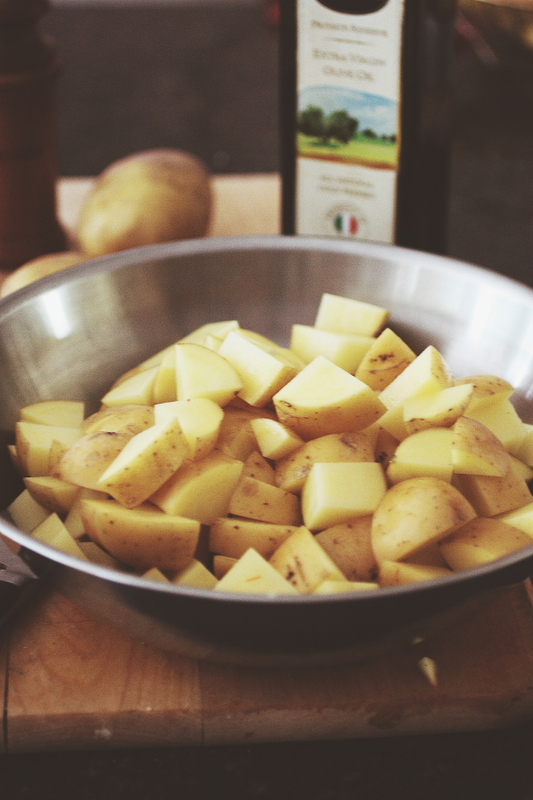 David Lebovitz gives some great tips on recipe attribution in a 2009 post on the Food Blog Alliance site. All of that being said, it’s rare that I follow a recipe word for word. One of my favorite things about cooking is that I can be creative – not constrained by exact measurements and specific ingredients. I see recipes more as guidelines than as hard and fast rules. We all know that rules are made to be broken anyway, right? The originator of this roast chicken telephone message was Sheri Castle, a potential food blogger who received a recipe to adapt from Mastering the Art of Southern Cooking by Nathalie Dupree and Cynthia Graubart (with their permission, I’m assuming). Sheri created a blog just for this recipe, admitting that she’s “not a blogger,” just “blog-curious.” Her plan was to attend the 3rd Annual FoodBlogSouth conference in Birmingham in January to learn more about the craft. She, like myself and at least 13 other participants, signed up for this recipe telephone game, the results of which will be used in a session at the conference conducted by Cynthia Graubart. Sheri’s interpretation of the original recipe can be found here. I guess in this instance, the goal of the game is to change the message as much as possible, rather than the other way around. Below is my version of Sheri’s version – 2 degrees of Roast Chicken, so to speak. 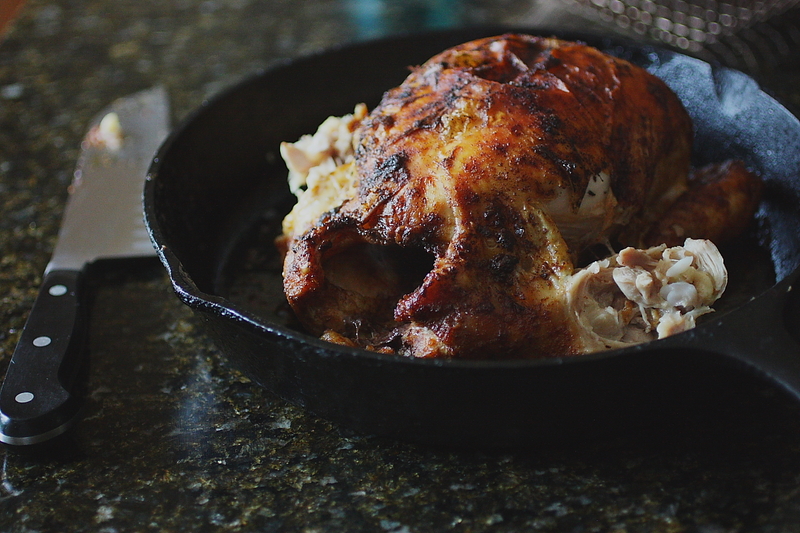 Oven-roasted chicken is the perfect canvas for being creative in the kitchen. 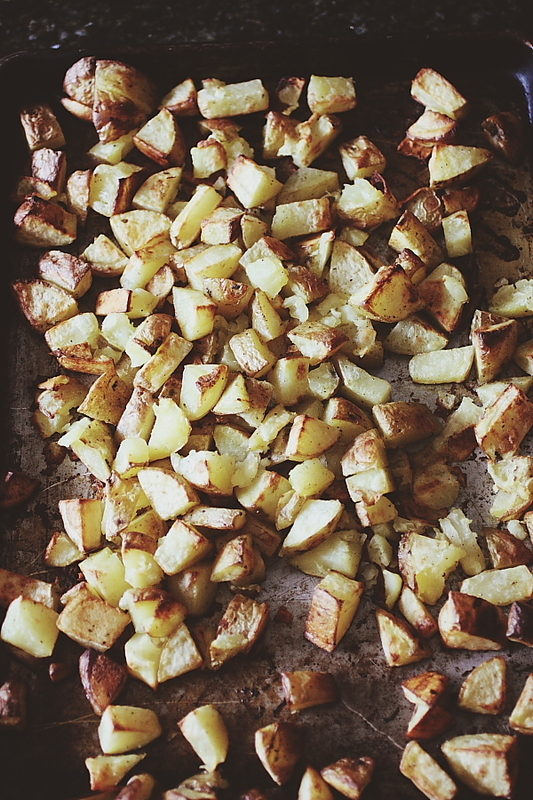 There are so many roasting techniques, flavor combinations and accompanying vegetables, the possibilities are nearly endless. 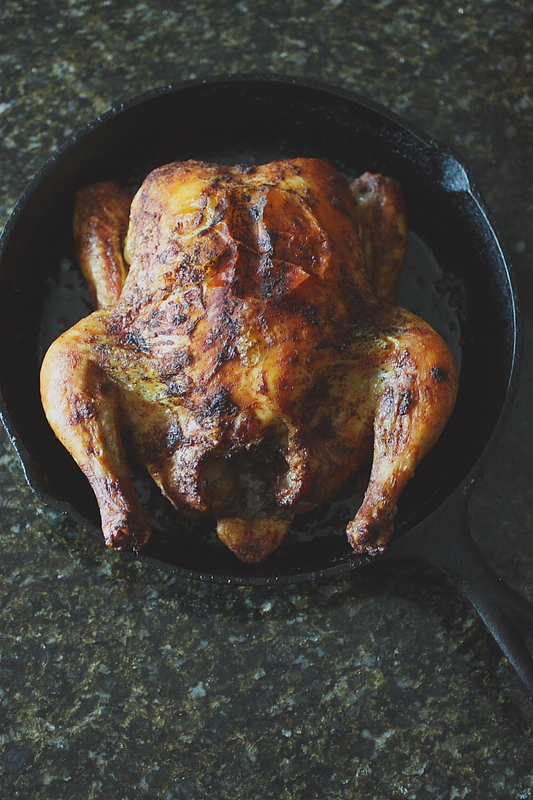 For many years I feared the roast chicken, having never found a technique that suited my last-minute lifestyle. In my effort to get dinner on the table for my family on a busy weeknight, I would sometimes end up with underdone birds. More often than not, though, I’d pull them from the oven dry and flavorless. 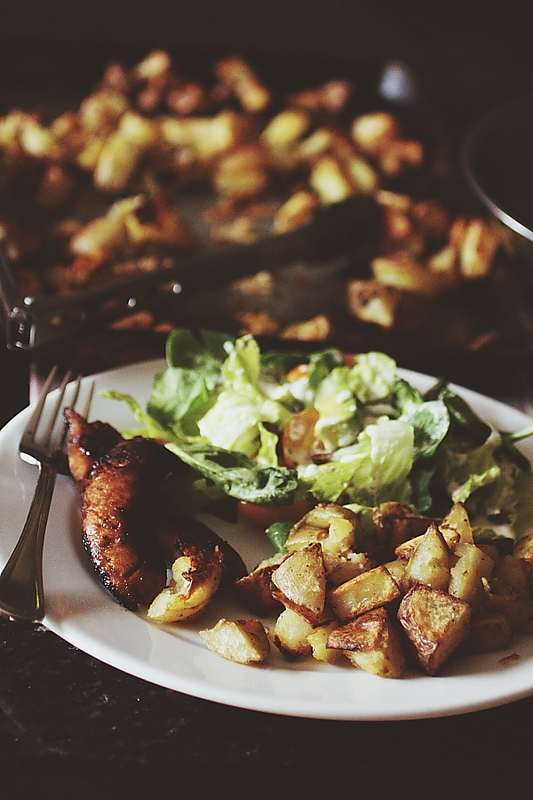 Recently I discovered the cast-iron cooking method, and my life has never been the same. 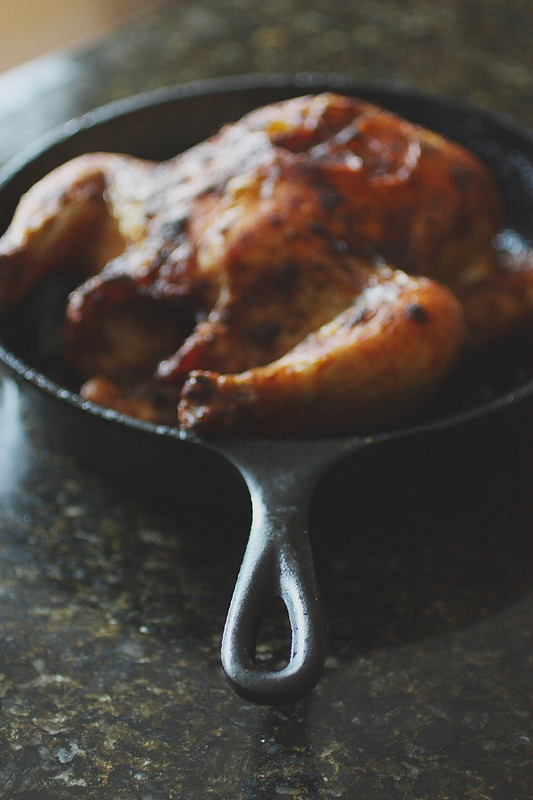 There’s just something about preheating that cast-iron skillet – getting it good and smoking hot – that really enhances the flavor of the bird and speeds the cooking process along. This time around, I decided to add some Asian flavors to the mix. Garlic and ginger combine with scallions, oranges and soy sauce to create a sweet-salty flavor combination. The marinated chicken nests atop a bed of Brussels sprouts, infusing the tiny cabbages with it’s savory juices. The chicken comes out with golden crispy skin, and the sprouts are tender and caramelized, bursting with deep umami flavor. Begin by patting the chicken dry with paper towels and removing any extra parts (like the neck, heart and gizzards) that might be in the cavity. Place the chicken in a zip-top bag. Combine the 1/4 cup oil, soy sauce, orange juice, zest, ginger, garlic, scallions and black pepper and pour into the bag, evenly coating the chicken. Zip the bag closed, squeezing out as much air as possible as you go. Massage the chicken a bit, making an effort to get the marinade all over the bird. 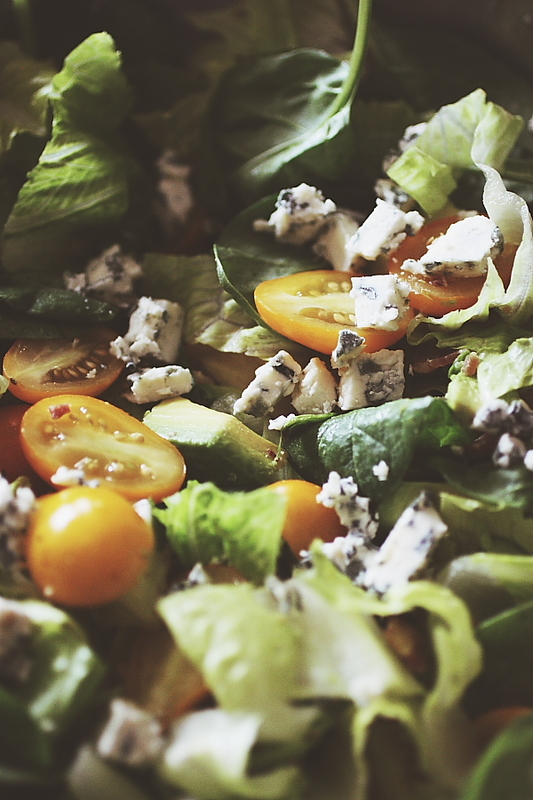 Refrigerate for at least an hour, but up to 24 hours (the longer the better, really). About 30 minutes before you’re ready to cook the chicken, place a large iron skillet on the lowest rack in your oven and preheat the oven to 425F. Remove the marinated chicken from the refrigerator. 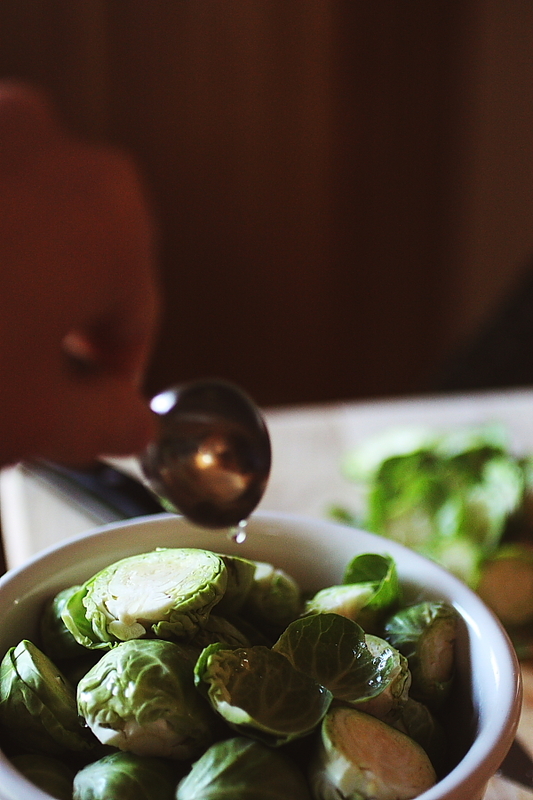 Toss the halved Brussels sprouts with 1 Tablespoon of oil. Once the oven has preheated, and the skillet is hot, remove the skillet from the oven and place it on a heat-proof surface. Pour the Brussels sprouts into the hot pan and spread them evenly across the bottom. Remove the chicken from the bag, scraping the excess marinade off as you do. 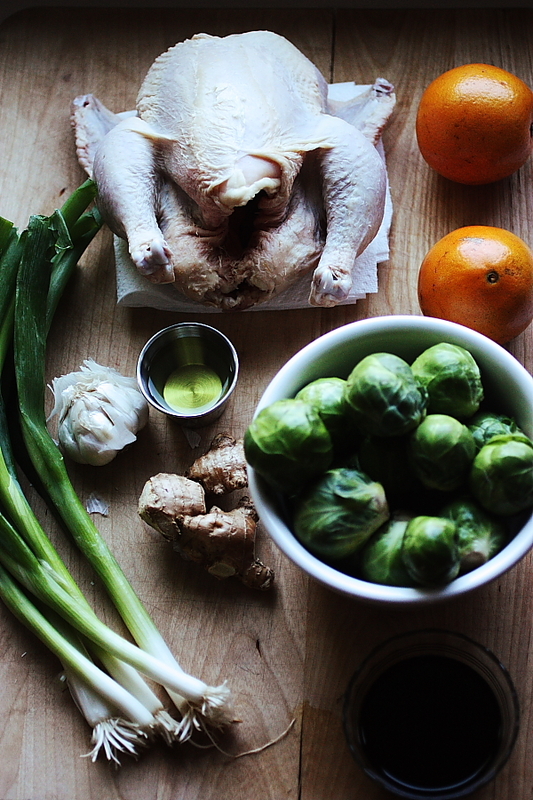 Place the chicken, breast side up, atop the sprouts and return the pan to the oven. Roast for 45 minutes, or until an instant read thermometer placed in the thickest part of the thigh registers 165F. 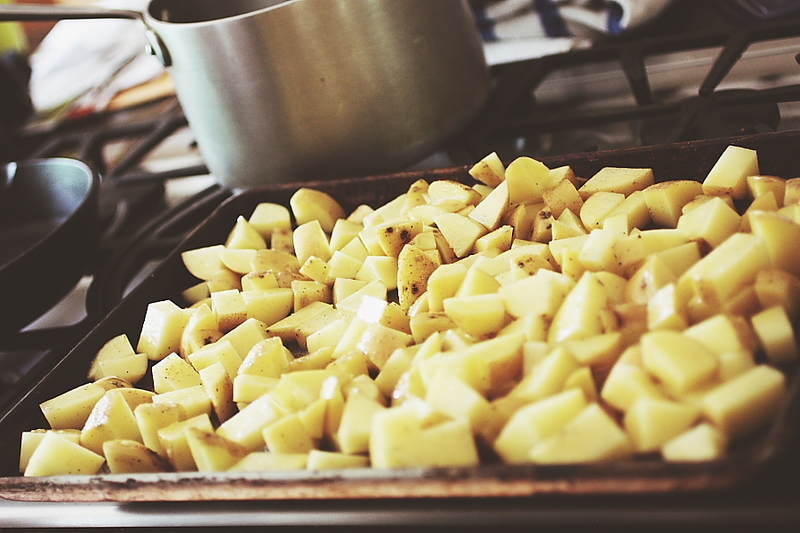 Remove from the oven and allow to rest for 15 minutes before serving. 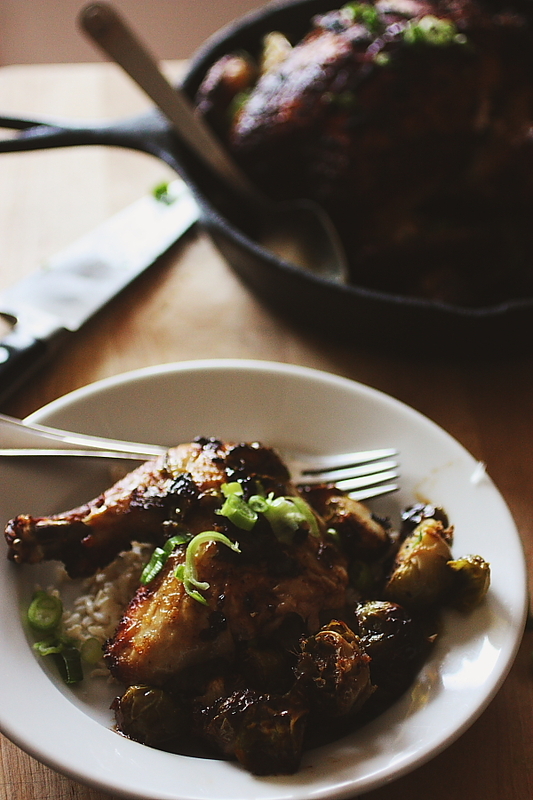 Serve with accompanying Brussels sprouts on a bed of steamed rice. Drizzle with any excess pan juices. Enjoy! It’s always been one of my favorite months of the year. The weather is cooler, the sky is clear and impossibly blue. 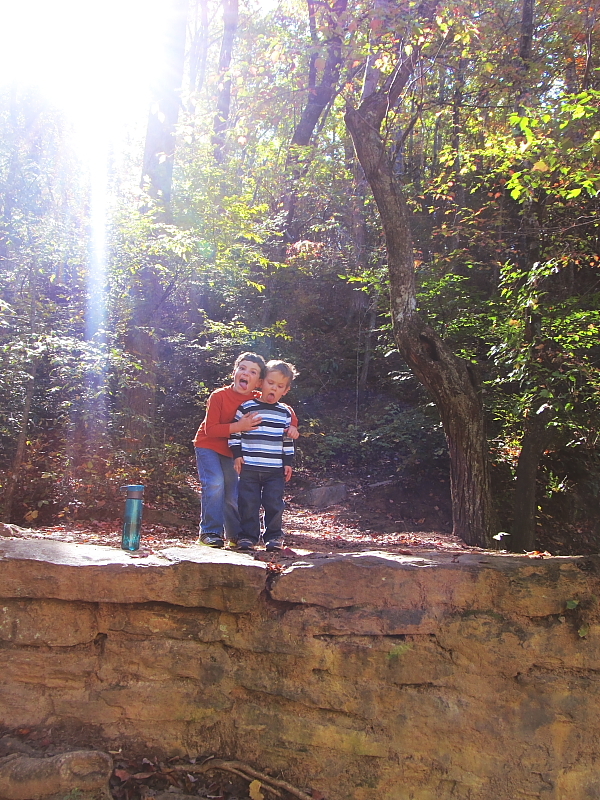 It’s a month of celebrations in our house: my youngest’s birthday, my birthday, Thanksgiving. Lots of opportunities to consume ridiculous quantities of delicious food. And cake. And pie. November is a good month. For the last three years, though, November has also brought with it a little bit of worry and uncertainty. Just a little, but it’s still there. Every November, for the last three years, we’ve had a follow-up appointment with our oldest’s cardiologist. He’s a wonderful doctor, and our visits are always pleasant, but there’s always that little bit of fear in the backs of our minds when that appointment reminder comes in the mail. When P was almost four, he underwent open heart surgery to repair a congenital defect in his heart. The surgery went beautifully, and he’s had no complications since, which is a blessing. I won’t get technical here, but there are a couple of areas that still require regular monitoring, just because they could become issues as his body grows and changes. So, while we’re thrilled with how well he’s done since the surgery, there’s always that tiny nagging worry that they’ll see something on the echo. Today was this year’s appointment. The doctor listened and poked and prodded and listened some more. The sonographer did her job and took some beautifully eerie pictures of my boy’s heart. And P got to watch Cloudy with A Chance of Meatballs and relax. 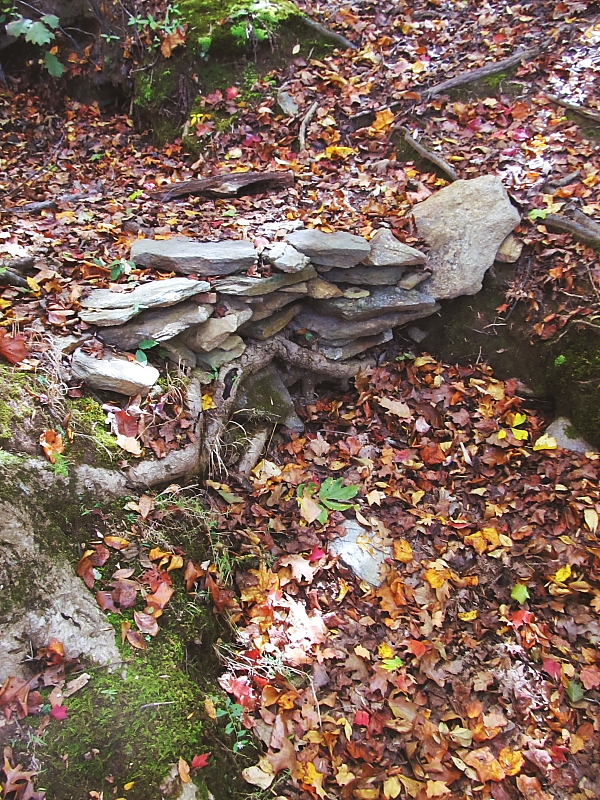 The cardiologist assured us that everything looked fine, even in those areas of concern. We breathed a quiet sigh of relief. Another reason to celebrate this month. We don’t have to go back for two years, which leaves me with mixed feelings. In a way, I’m glad that he’s doing so well that our doctor is confident that two years is a safe period of time to wait until our next visit. But there’s also a part of me that needs that yearly reassurance, as stressful as it might be. Next November will come and go without that appointment reminder. I’m sure I’ll still worry, though (I am his mother, after all – that’s what we do). 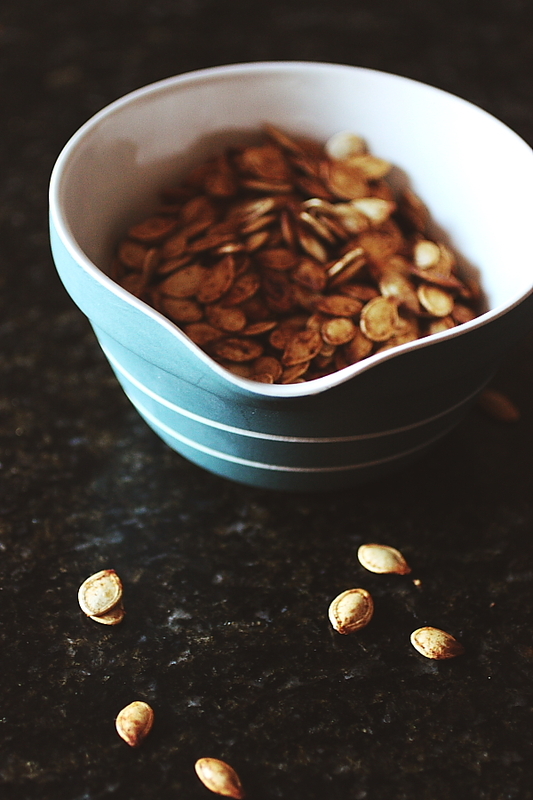 One of P’s (and my) favorite things in November is roasted pumpkin seeds. 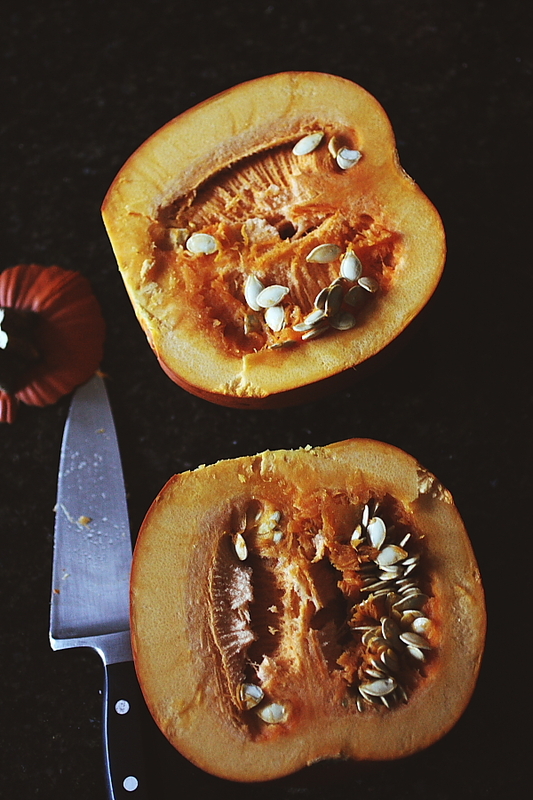 Every year he looks forward to taking the seeds from our Halloween jack-o-lanterns and roasting them the next day. He takes them in his lunchbox to school, and he eats them for snack when he comes home. If we’re not careful, he’ll have pumpkin vines growing out of his ears. This year, he’s also become obsessed with pomegranate seeds, so we find ourselves in the afternoons alternating between a small bowl of each – our fingers tinged pink and slightly salty. I love that he loves these things. 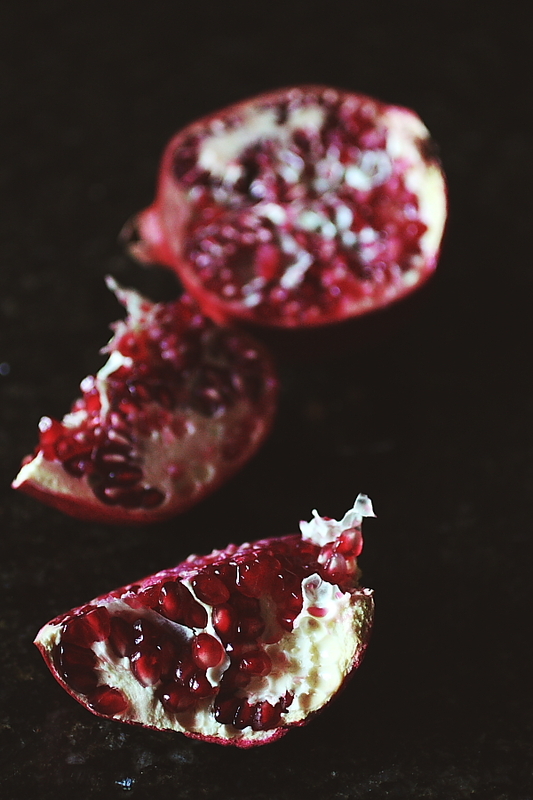 The pomegranate seeds require nothing more than cutting open a pomegranate and carefully scraping the seeds from the membrane. 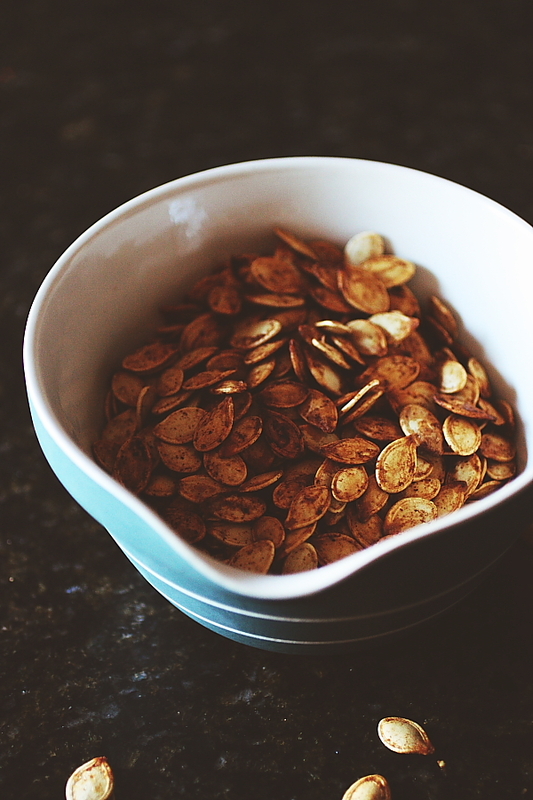 The pumpkin seeds, while pretty simple, require a little bit more work than that. The combination of spices I used this year really made them irresistible, so we’ve pretty much finished off the batch I made a couple of days ago. I guess I need to buy a couple more pumpkins. Store in an airtight container at room temperature for a couple of day. After that, store them in the refrigerator or freezer. I have to admit, these drumsticks were not totally my idea. 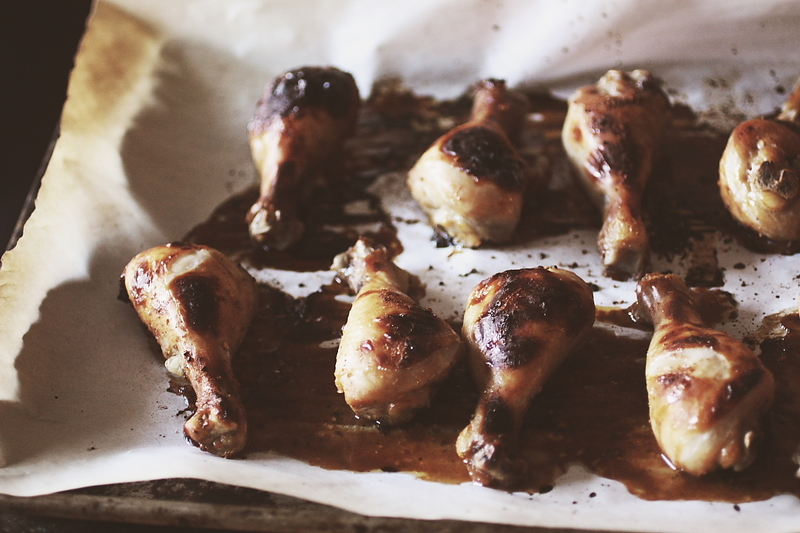 First, there were these Caveman Pops (aka Roasted Turkey Legs) over at The Pioneer Woman Cooks. And they sure did look tasty. 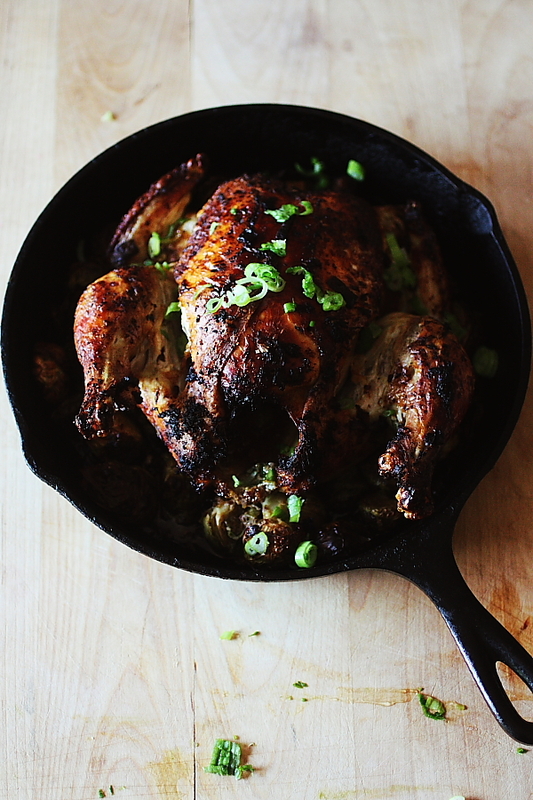 Then, there were these Berbere Roasted Chicken Legs over at Gluten Free Girl. Her description of berbere, with its ginger and garlic and cardamom and chiles, made my mouth water. And then there were the two packages of chicken drumsticks that I had in my freezer, gently calling my name, asking to be brined and spiced and roasted. What? Your chicken doesn’t talk to you from your freezer? The key to this recipe – the thing that takes it from typical weeknight chicken to something worthy of sharing – is the brine. It does something to the chicken, elevates it somehow. The combination of apple cider, sugar, salt and ginger really takes this chicken to the next level, imparting flavor all the way through to the bone and leaving the meat moist and tender. And then the spice rub, which is one of my own devising, added a nice spicy kick to the whole thing. Remove them from the oven and enjoy! 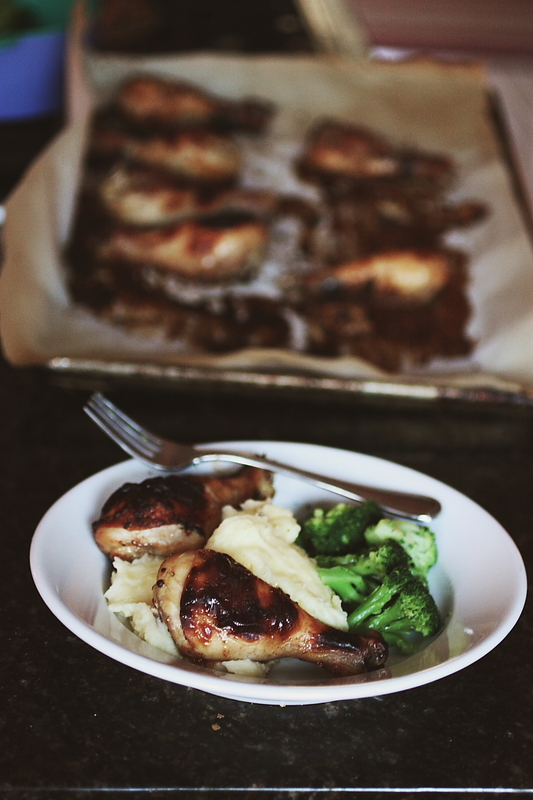 We served ours with some cheddar mashed potatoes and steamed broccoli for a relatively simple weeknight meal. 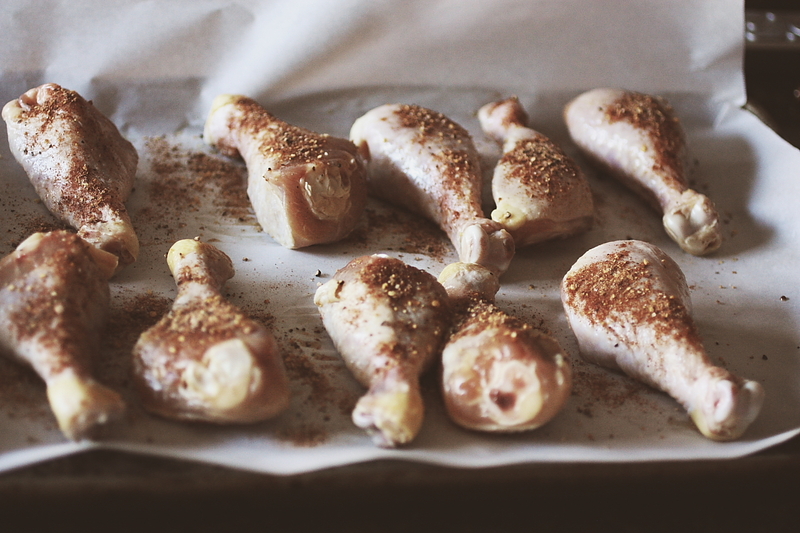 I did remove the skin from the drumsticks I gave to the kids because the dry rub made them a tad spicy. If your kids tolerate heat, I think they’d love these. 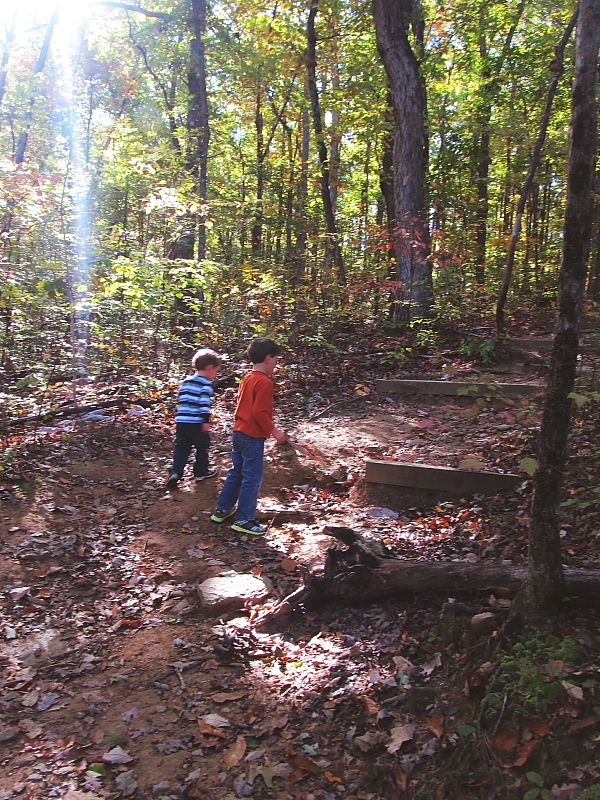 My kids left nothing but gnawed leg bones on their plates, so the lack of skin certainly didn’t seem to bother them. 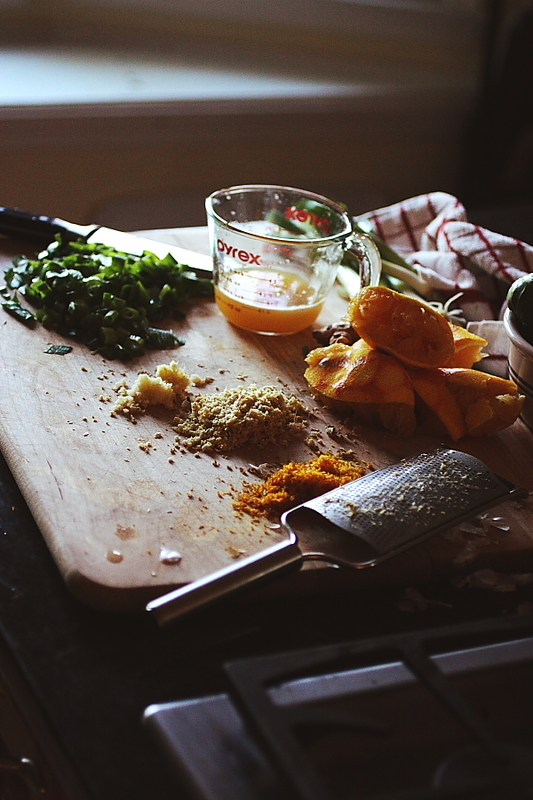 Place all ingredients in a spice grinder and grind.